Gregory Mattix: The Heroic Adventure Concludes! 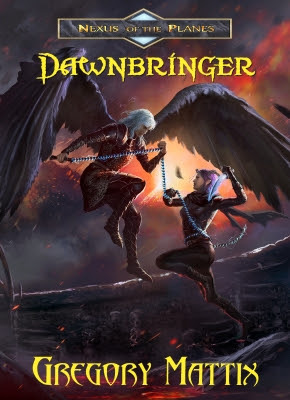 Dawnbringer, Book 3 of Nexus of the Planes is now available at your favorite retailer! Find it here: Amazon. Read for FREE on Kindle Unlimited! Nera and Malek are reunited and have escaped from the Gray Lands after defeating the evil that destroyed that world. Fresh off their victory, the pair now turns their attention to saving Nexus. Nera’s path has become clear—she has been chosen by the goddess Sabyl to find a way to restore the Machine of Nexus to working order and end the violence in the city. Unfortunately, the path she and Malek are destined to walk is a dark one, and should they survive, they will be changed forever. For they must gather together a stalwart party to venture into the depths of the Abyss and locate the mysterious Engineer of legend—who claims to be Nera’s father and is the only one capable of repairing the Machine. The powers of the Abyss will stand in their way while demon hordes mobilize to attack Nexus and spread slaughter and destruction across the entire multiverse. Dawnbringer is the thrilling conclusion of Nexus of the Planes, an epic fantasy series from the author of Extensis Vitae.